And now for something completely different. Currently on display at the DeCordova Museum in Lincoln, Massachusetts is something they call Trainscape. (Lincoln is just west of Boston, outside the I95 loop.) This is not really a model railroad, but a series of installation art works linked together by an operating O-scale train. The train is an integral part of the art, but it is "not an attempt to represent reality at a miniature scale as in traditional model railroading." The link below is for the museum web site page for this exhibit. 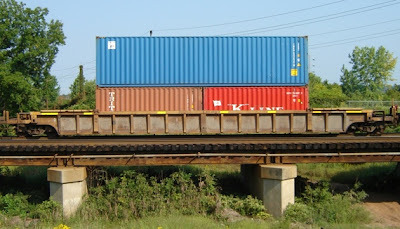 On that web page is a link for downloading a train-cam video of the exhibit. I personally don't think the train-cam shows the exhibit very well. 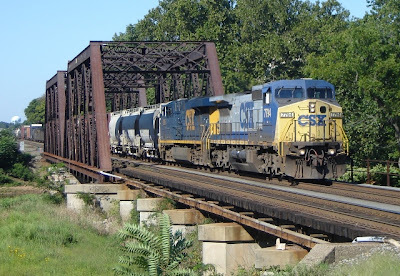 Omaha, Neb., September 07, 2007 – Today, Union Pacific announced that construction is underway on the $43 million double-track high bridge. When the 2,550-foot long and 190-foot high structure is completed, it will be one of the highest double-track railroad bridges in North America. The new bridge will improve operational efficiency in anticipation of expected growth in our customers’ businesses and increased freight volumes. "The new Boone High Bridge is a modern-day engineering feat that will enhance our long-term ability to improve operational efficiency and customer service," said Bill Wimmer, vice president - Engineering. "This is the type of major investment in replacement infrastructure that railroads must make, but will be able to afford only if they can obtain adequate revenues." OCCI, Inc. based in Fulton, Missouri, is the contractor that was awarded the project and Omaha-based HDR Engineering Inc., provided the engineering, drawings and obtained the necessary permits for the construction of the bridge. Construction on the bridge began in March and is scheduled to be completed by November 2008. This posting is thanks to info in an email from Nathan S. Clark, Jr., who included the following comment and links. "I do not know what implications this new structure will have for thelong-term future of the historic and famous Kate Shelley bridge, nearby." These links have pictures of the Kate Shelley bridge, and the first one has some description of the bridge. 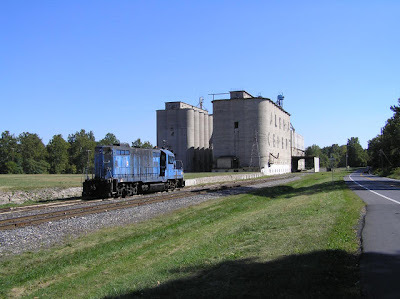 Kate Shelley was a real Iowa railroading heroine, and you can read more about her at any of numerous web sites by doing a search on "Kate Shelley Iowa". I think you will find her story interesting. 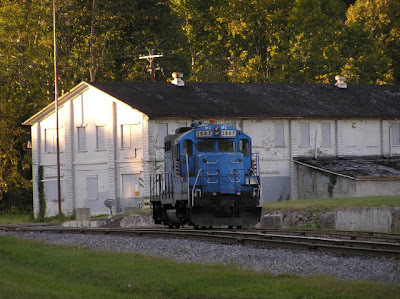 NS 24Z @ 7:40 Power unknown was holding on the siding at CP Bound Brook. Evidently 24Z was being held for a short time due to track construction. CSX Q707 (Oak Island, NJ to Philadelphia, PA) @ 9:10 was a relatively short trash train powered by NYC 4448 (GP40-2, ex-CR 3391) and CSX 8072 (SD40-2, ex-L&N 8072). NS 24V @ 9:50 an intermodal whose power consist would be two C40-9Ws, NS 9393 and NS 9143. For the modelers reading this, two roster shots are included for reference purposes. "The 'gravitational pull' of Wyoming (Powder River Basin) coal was evidently just too great, and it even reached across the northern border and 'pulled in' another big one. On one hand, this would mean that the DM&E will never expand to become the 'next Class I'. On the other, it will likely result in a new avenue deep into the Northeast for PRB coal via a single rail carrier (if the proposed DM&E coal extension is still built/upgraded). 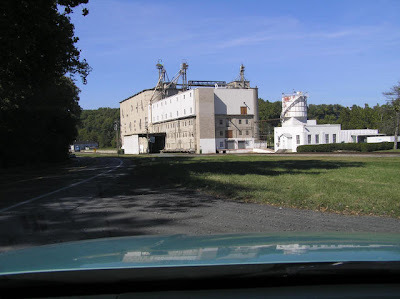 This will also probably bode well for the former D&H routes." ---Nathan S. Clark, Jr. This a very exciting time: CP has just announced an agreement to acquire the Dakota, Minnesota & Eastern, the largest regional railroad in the United States for US$1.48 billion. On many occasions over the past several years, you have heard me comment about our ability and our intent to grow our franchise. Through the implementation of our strategy, we have consistently delivered on our operating and financial commitments. We have become a high performance organization and we are positioned to grow. Today's announcement and the recently announced Alberta Industrial Heartland strategy both signal the evolution of our company from a high performance organization to a high performance growth-oriented organization. We are growing to expand the reach of our franchise. But we are only able to make these significant moves because of our proven ability to deliver on our financial commitments.
" Dedication ceremony of a monument to all employees of Central Railroad of New Jersey will be held on Thursday, September 20th at 11:00 am. The ceremony will take place on the main concourse of the former CNJ station in Jersey City, now Liberty State Park. The monument is mounted between tracks# 10 and 11. Please note that as this event is open to the public, the primary purpose is to offer recognition to all former employees who attend; therefore, preferred seating will be held for these employees." 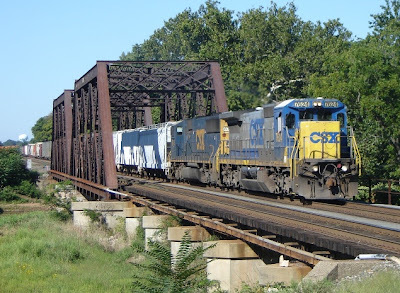 8:45 CSX Q300: would have CSX 167 (AC44CW) and CSX 9018 (C44-9W) on this very long train (estimated 143 cars and 550 axles). 8:58 CP 38T: this was the pleasant surprise of my morning! 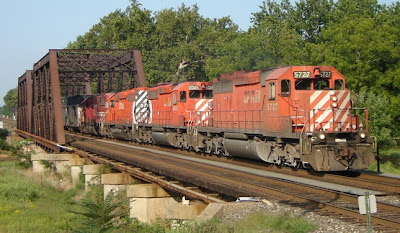 Power would consist of four SD40-2s, CP 5727, CP 6045, CP 5709 and CP 6055. 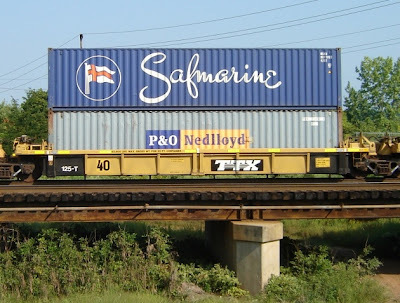 It would hold for Q300 at Port Readingh Jct before proceeding east on the Lehigh Line. 9:15 NS 212: Two C40-9Ws, NS 9965 and NS 9936, provided the motive power for a train consisting of all autoracks and one COFC. 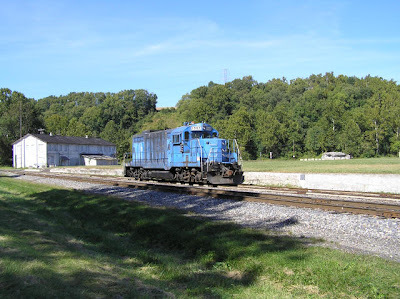 9:24 MA1: would head out of Manville yard with CSX 6071 (GP40-2, ex-B&O 4172) in charge of two boxcars. MA1 would then hold for two eastbound NS intermodals at CP Bound Brook. 9:33 NS 20? 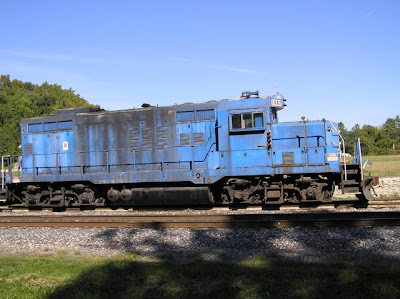 : would have NS 2747 (SD70M-2) and NS 7555 (ES40DC) for power. 9:40 NS 24Z: or could it have been 24V since it was tough to decipher over the scanner? 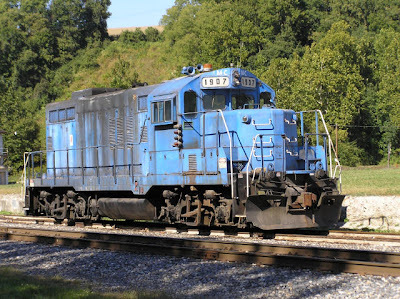 Power was NS 7592 (ES40DC) and NS 9897 (C40-9W). 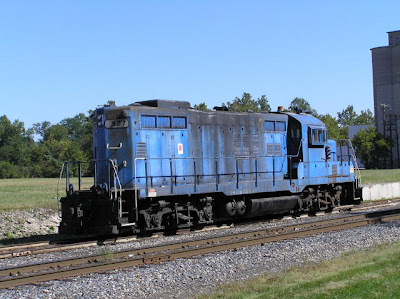 8:30 NS 21M: would have NS 9341 (C40-9W), NS 8666 (C39-8E) and NS 6780 (SD60M, ex-CR 5530) for motive power. 9:30 NS M8G: would take the passing siding to go around around NS 11J. 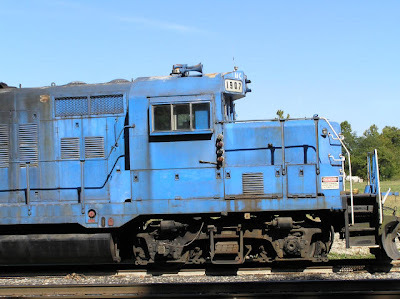 M8G's power consisted of NS 9849 (C40-9W) and PRR 6777 (SD60M, ex-CR 5526). Once M8G cleared, NS 11J then proceeded west. 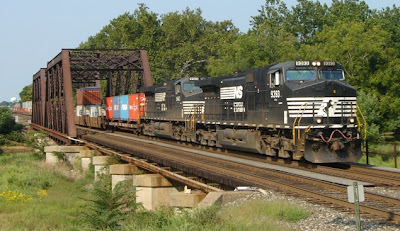 NS 9366 (C40-9W) and NS 2550 SD70) would be in charge of seventy-three autoracks. 9:45 CSX Q300: with its work complete in Manville yard, CSX 7624 (C40-8) and CSX 8743 (SD60I, ex-CR 5630) would take its train of mixed freight east. 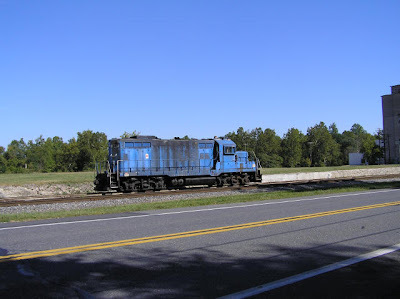 10:00 CSX Q418: would follow shortly behind Q300. CSX 7794 (C40-8W) ande CSX 5395 (ES44DC) would be in charge of this train of mixed freight. Received the following information via email. Want to make you aware of the initial announcement concerning the C&A RHG-sponsored symposium on November 10 in Bordentown. Noted rail historians Bill Withuhn (Smithsonian), Chris Baer (Hagley), Kurt Bell (RRMofPa), as well as several well-known local rail historians, will be making presentations. See attached flyer for preliminary details. 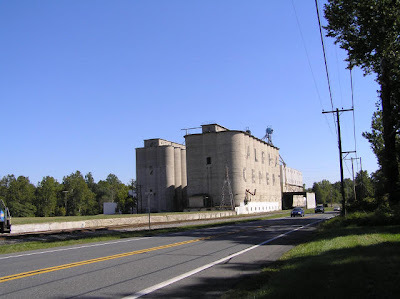 The C&A Railroad Historical Group is a non-profit educational organization and a chapter of the Pennsylvania Railroad Technical & Historical Society (PRRT&HS). 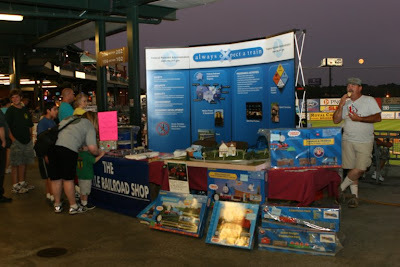 Monday evening, 8/27/07, was Thomas the Tank Engine night at the Somerset Patriots game against the Long Island Ducks; and the Big little Railroad Shop had a table there where we were running Thomas the Tank engine in O scale. 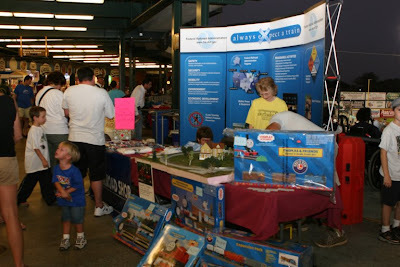 We also had a large display board from Operation Lifesaver - always eXpect a train. 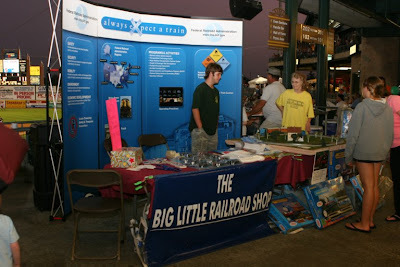 The Black River and Western Historic Trust was also at the game with a table telling all about their organization and railroad. 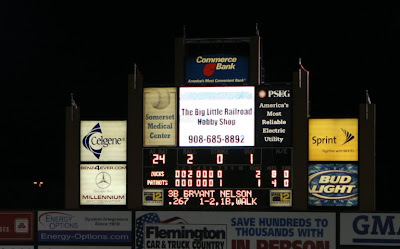 The pictures below show the scoreboard at the 7th inning stretch and our table. By the way, the Patriots lost 3 - 2 in 12 innings.